It would do a disservice to Hereditary (2018) to define it as anything other than a film lover’s horror film. Under that banner, Hereditary succeeds in numerous ways. It does so by leaning heavily into the archetypes and tropes defined by the horror genre but exceeds expectations by paying great respect to the artform itself, delivering a unique theme and narrative that culminates in a third act that leaves you breathless. All of that said, these are also the same lines along which Hereditary fails. In playing to both sides of the aesthetic and narrative aisle, it simplifies both and, when stretched like this, isn’t able to deliver the cinematic punch that either would do on their own. Hereditary is, at the very least, a very well-directed film. Ari Aster shows his deft hand, but in sometimes subtle ways that enhance the effect of an oft "on-the-nose" genre. Allowing a devastating moment to breath for what feels like ages isn’t something that would define the average popcorn flick. Aster, by lingering on the distraught face of Peter (Alex Wolff) as he realizes his sister Charlie’s (Milly Shapiro) fate, shows that there is indeed a brilliant, bold cinematic mind behind the film. Wolff’s performance is marked by excellent scenes such as this but also by moments that seem like they should have hit the editing room floor. But one cannot bring up the performances and not discuss Toni Collete. Her portrayal of Annie is iconic and more nuanced than I imagine she will receive credit for. The common reaction when watching characters of her type is to feel uncomfortable—think of Shelley Duvall's fumbling, shattered portrayal of Wendy Torrance in The Shining. To Collete’s credit, her character just oozes with life and uncomfortable realism. Pushed to every end possible, her performance takes those uncomfortable moments that dominate the genre and puts them square within the realm of reality. 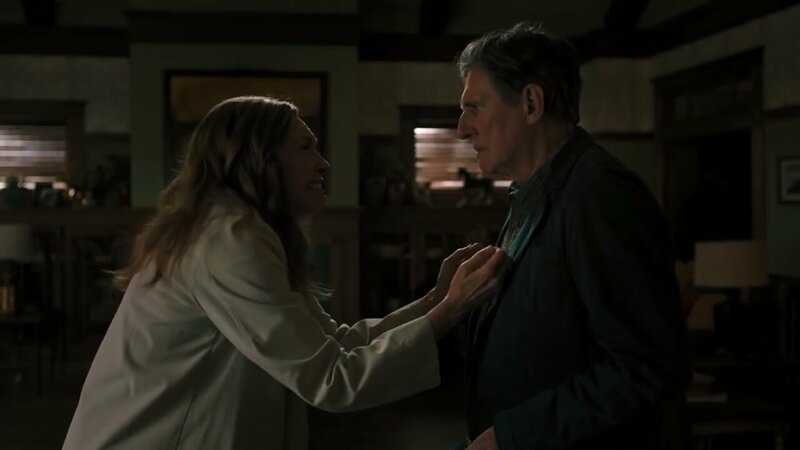 The long takes utilized by Aster, specifically one towards the end when Annie pleads with Steve (Gabriel Byrne), are moments where lesser films would move quickly to end the, “uncomfortableness.” To Hereditary’s credit, it doesn’t. Collete's performance, and the editing in tandem, creates an authenticity that sets it apart from other genre films. The miniature home that defines Hereditary is an incredible, unique visual device, and its placement at the outset poses a thematic question that Aster routinely riffs on throughout the film. The narrative gravitates around the singular concept that we are characters in a story that’s being played out by unknown actors—in short, we have no agency. Clearly, the miniature house does a great deal to communicate this, but, while it’s a very strong visual device, here is where the problem with Hereditary truly lie. In the first act, we’re presented with a surprisingly unique, clear cut visual device that is a compass towards the films thematic intention, and in the scenes following we get more clues towards this same theme. But, as we enter the second act, the focus on this central theme begins to fall away with a clear emphasis put on supporting the actual plot of the film. This is when we meet Joan (Ann Dowd) and things begin to unravel, becoming incredibly intense and more horrific. Unfortunately, the film does so without contributing much to the central theme. When we enter the final act this all comes to a head and we have perhaps the most successful combination of theme and plot. But this doesn’t have the effect that was intended because of the way it is set up. The first act of Hereditary writes a check that the second and third can’t cash because the film is simply not nuanced enough moment to moment to adequately serve both theme and plot (with clear, salient exceptions of course). The effect of this is that Hereditary postures itself to be a film with unique depth but ends up only being a film with a unique theme. There's an important distinction in that. To fully understand Hereditary, you need only the single visual example delivered in the opening. And, while the plot carries the film, if you’re expecting a late-film revelation, it doesn’t come. Instead, you realize that it actually is that simple. In combination with the miniature that opens the film this makes for an interesting discussion, but it is one that comes to a clear destination very quickly and does not inspire further interest. Hereditary is a film that I will recommend to virtually any person that has a relative interest in horror. The performances and directing make the film a worthwhile experience—not just as entertainment but as a healthy part of your cinematic diet. The elements that define its failures don’t undermine the entire film, but, despite the general public and critical praise it has received, Hereditary leaves you with far less to chew on than other iconic genre films. Bret Hoy is the creator and co-editor of Monolith Medium, an award winning filmmaker, and writer.